alaTest ha raccolto ed analizzato 10 recensioni su Samsung Galaxy Amp. La media della valutazione per questo prodotto è 3.8/5, confrontata con la media della valutazione di 4.3/5 per altri Cellulari. I commenti su portabilità e qualità fabbricazione sono generalmente positive. In aggiunta, qualità suono e prezzo sono inoltre apprezzati ma si riscontrano valutazioni differenti riguardo la fotocamera. Abbiamo analizzato differenti valutazioni di esperti ed utenti, età del prodotto ed altri elementi. A confronto con altri Cellulari, Samsung Galaxy Amp ha ottenuto un alaScore™ complessivo di 82/100 = qualità Molto buono. A brand-new phone for AT&T's brand-new Aio Wireless prepaid arm, the Samsung Galaxy Amp does a fairly good job balancing entry-level Android features with cost. The entry-level Samsung Galaxy Amp runs Android 4.1, gives strong call quality, and has a solid 5-megapixel camera. There's no LTE on the Galaxy Amp, internal memory is abysmal, and the phone is only available in a handful of cities. 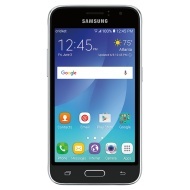 If you're within newbie Aio Wireless' tiny network and looking for an affordable Android phone, the Samsung Galaxy Amp is a good buy. If you live within newbie Aio Wireless' tiny network, the $130 Samsung Galaxy Amp smartphone is a good no-contract Android buy. The entry-level ; runs Android 4.1, gives strong call quality, and has a solid 5-megapixel camera. "A good phone for the price but not simple to operate." Price is good and also AIO network. Young people in the store were very helpful. Good Connection with ATT. Screen is bright and clear and small enough to put in a pocket. Voice to text is good but difficult to set up. Sound quality is good. Very hard to learn how to operate everything. You have to download the instructions, almost 200 pages. Answering a call or checking voice mail can be difficult. Don't think the battery lasts as long as they advertize. A good phone for the price but not simple to operate. "Best phone for the price." Great size, features, super-fast 4G network, excellent service, phone is great quality...love this phone! So new...Hard to find accessories for it. Best phone for the price. I am so happy that I got this phone it works better than any other phone that I have ever had. very happy with product priced very well , would tell other people about it promote it .